The award-winning journey of friendship and harmony involving sixteen children from eight schools in south-west Sydney as they explore their local environment and work collaboratively on art and writing. In 2005 author Nadia Wheatley and artist Ken Searle developed a Harmony Project with sixteen students from eight infant and primary schools in Sydney - some Muslim, some Catholic, some government schools. As well as experiencing the harmony of the natural environment, the children were encouraged to learn about harmony between the traditional owners and the land, and to find harmony in friendship and collaboration. 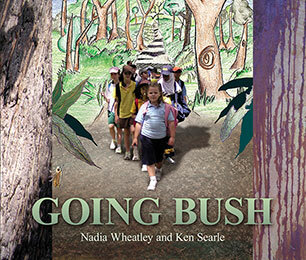 Going Bush showcases some of the students' illustration and writing, linked together with art and design by Ken Searle and a narrative by Nadia Wheatley. Nadia Wheatley is an award-winning author whose books over thirty years reflect a commitment to issues of Reconciliation, social justice, and the conservation of the environment. She has been nominated by IBBY Australia for the 2014 Hans Christian Andersen Award for Writing - the highest international recognition given to a living author whose complete works have made a lasting contribution to children's literature. Ken Searle is best known for the cityscapes that he has exhibited during a forty-year career as an artist. In his illustration and book design, he draws upon the same sense of composition to take the reader on a journey through the landscape of the book. Over the last decade, Nadia Wheatley and Ken Searle have variously written, illustrated, designed or compiled five books that express aspects of the Indigenous principles of education that they experienced while working as consultants at Papunya School (Northern Territory).